Her Majesty Queen Sonja was born in Oslo on 4 July 1937 as the daughter of Dagny (1898-1994) and Karl August Haraldsen (1889-1959). When King Harald ascended to the Throne upon the death of King Olav, Queen Sonja became Norway's first queen in 53 years. Queen Sonja grew up in the district of Vinderen in Oslo, and completed her lower secondary schooling in 1954. She received a diploma in dressmaking and tailoring at the Oslo Vocational School, and went on to receive a diploma from École Professionelle des Jeunes Filles in Lausanne, Switzerland. Her studies there included social science, accounting and fashion design. She returned to Norway for further studies and received an undergraduate degree (French, English and Art History) from the University of Oslo. Miss Sonja Haraldsen first met Crown Prince Harald in 1959. It was not until nine years later, however, that she and the Crown Prince were given permission to marry. In March 1968 it was announced that King Olav had given his consent for the Crown Prince to marry a commoner. The engagement between Miss Haraldsen and Crown Prince Harald triggered a debate regarding the future of the monarchy in Norway. There was far less resistance to the idea of the Crown Prince choosing a commoner to be his wife than many had feared. The Norwegian people immediately accepted Crown Princess Sonja as a member of the Royal Family. The wedding was held in Oslo Cathedral on 29 August 1968, and Miss Sonja Haraldsen became the Crown Princess of Norway. King Harald and Queen Sonja have two children, Princess Märtha Louise, born on 22 September 1971, and Crown Prince Haakon, born on 20 July 1973. Queen Sonja accompanied King Harald when he swore his oath to uphold the Constitution in the Storting on 21 January 1991. This marked the first time in 69 years that a Norwegian Queen had been present in the Storting. Subsequently, the Queen, frequently together with Crown Prince Haakon, has accompanied the King to the formal opening of the fall session of the Storting and the reading of the Speech from the Throne. In accordance with their own wishes, King Harald and Queen Sonja were consecrated in Nidaros Cathedral in Trondheim on 23 June 1991. In connection with the consecration ceremony, the King and Queen conducted a 10-day tour of Southern Norway. The following year, the entire Royal Family conducted a 22-day tour of Norway’s four northernmost counties. The Queen accompanies the King on official state visits abroad, and she participates when foreign heads of state pay official visits to Norway. Every year the King and Queen usually pay a visit to a county in Norway. Their stay lasts 2-3 days, during which time they pay visits to several municipalities. They often use the Royal Yacht Norge to travel along the Norwegian coast. The Queen carries out a multitude of different tasks including travelling, official visits, participation at events all over the country, audiences, receptions and meetings at the Royal Palace. In addition to her many official duties the Queen also takes active part in following up internal activities relating to the Palace and the other Royal Residences. Queen Sonja has a strong sense of social engagement. She has been patron of and has played an active role in a variety of large-scale fundraising initiatives. Queen Sonja was a member of the committee for the first nationwide humanitarian telethon campaign in 1974, which raised funds for refugees. More recently, in 2010, the Queen was patron for the 2010 telethon campaign in support of the Norwegian Refugee Council's work to help and protect people fleeing from war. In 2016 The Queen and The Crown Princess were both patrons of the telethon in support of the Norwegian Red Cross. Queen Sonja served as Vice President of the Norwegian Red Cross from 1987 to 1990. Her Majesty was awarded the Nansen Medal by the United Nations High Commissioner for Refugees for her efforts. The Queen seeks to follow up her interest in social issues to the greatest extent possible, attending conferences and key events for organisations dealing with relevant issues. Every year before Christmas Queen Sonja pays visits to institutions for various social groups such as children, vulnerable women, elderly people, the homeless and substance abusers. The Queen is also concerned with conditions for immigrant women in Norway. She has met with representatives of women with minority backgrounds on many occasions, in connection with conferences, seminars and receptions at the Palace as well as through visits to private homes. Queen Sonja is patron of the MIRA Centre for Black, Immigrant and Refugee Women. The Queen has a strong commitment to schooling and education. In 2005, she took the initiative to establish Queen Sonja’s School Award. The award is presented annually to a Norwegian school that has demonstrated excellence in its efforts to promote inclusion and equality. The award is administered by the Norwegian Directorate for Education and Training, which also appoints a jury to select the year’s recipient. The award consists of a cash prize of NOK 250 000 and a signed print by the Queen. 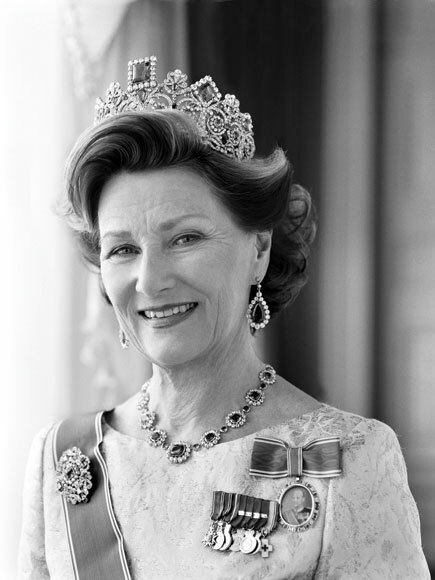 Queen Sonja has many interests that she combines with her duties as Norway’s First Lady. The Queen is particularly interested in art and culture, and attend art exhibitions and cultural events both in Norway and abroad as her programme will allow. She is also concerned with monuments of the past, and is patron of the Society for the Preservation of Ancient Norwegian Monuments. The Queen is greatly interested in the visual arts. Works from her private art collection were exhibited at the Henie-Onstad Art Centre at Høvikodden, near Oslo in 2001 and 2012, and at Scandinavian House in New York in 2005. In 2011, the Queen established Her Majesty Queen Sonja’s Art Award in cooperation with artists Kjell Nupen, Ørnulf Opdahl and Ole Larsen. The award was initially presented to Nordic artists working in a paper-based format. The first recipient was Finnish graphic artist Tiina Kivinen in 2012. In 2014, the prize became an international distinction and was renamed the Queen Sonja Print Award. The first international recipient was US visual artist Tauba Auerbach in 2016. The Foundation behind the Queen Sonja Print Award seeks to generate interest in and promote the development of graphic art. The prize is currently believed to be the world’s largest graphic art award. In recent years the Queen herself has become a graphic artist and ceramicist, and her works have been on display in a number of exhibitions in Norway and abroad. Another of the Queen’s major interests is music. She is patron of the Norwegian National Opera and Ballet, the Oslo Philharmonic Orchestra, the Oslo Chamber Music Festival, the Norwegian Traditional Music and Dance Association, the Norwegian Youth Orchestra Association and Elverum Music Festival. She is also actively involved in the Queen Sonja International Music Competition. This competiton is held every other year and attracts outstanding opera talents from all over the world. Her Majesty follows the competition and presents the prizes to the winners. In Norway, the Queen is renowned for her interest in nature, outdoor recreation and the environment. There is scarcely a place in the country that the Queen has not visited. Several hiking trails and nature paths bear her name, and she is an honorary member of the Norwegian Trekking Association (DNT). The Queen’s concern about nature conservation and the environment has become more visible in recent years through her participation in clean-up actions. The Queen is a keen photographer, and often takes photographs of her trips in Norway. On several occasions, in Norway and abroad, Queen Sonja has given lectures and talks on Norway as a tourist destination at which she has shown her private photographs.